WINSTON-SALEM, N.C.— Notre Dame head coach Brian Kelly lost sleep before coming into BB&T Stadium to face Wake Forest on Saturday. With his team underperforming in the past two weeks, the decision to replace starting quarterback Brandon Wimbush with Ian Book was not an easy one, but it paid off in the long run for Kelly. Book rushed for three touchdowns and threw for two more, on the way to the No. 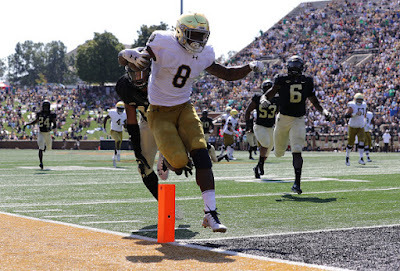 8 Fighting Irish’s 56-27 win over the Demon Deacons. “Every week, I’ve tried to prepare like I’m the starter, and when my name’s called, I need to go in there and play my best and make sure the offense can succeed,” Book said. Book looked polished in place of Wimbush, going 25-of-34 for 325 yards with the five total scores all coming less than 10-yard out. Notre Dame (4-0) scored over 24 points for the first time this season after struggling against Michigan, Ball State and Vanderbilt in the prior weeks. The Irish more than doubled the amount of points with Book under center and increased their average margin of victory which was seven points. Kelly shrugged off the quarterback switch and weighed in on how the future might look for his team going forward. “I had a lot of confidence in Ian and I thought our offense played to the level that it was capable of. That certainly showed itself today,” Kelly said. “I am going to reserve the right to decide each and every week who’s the best guy that week to win.” So much for a quarterback controversy when the Fighting Irish have two capable quarterbacks, along with Kelly’s willingness to split time or games between Wimbush and Book. As for Wake Forest (2-2), the struggles on defense continued on Saturday, handing the Irish 566 total yards on 76 plays. "Notre Dame outplayed us. They outcoached us. They outprepared us. They were just more ready to go than us today, and they showed it," Demon Deacons coach Dave Clawson said. "The score's probably closer than the game was." The 56 points for Notre Dame was the highest total for a road game since a 59-26 beat down Stanford in 2003. Wake Forest hosts Rice next week before seeing No. 3 Clemson on Oct. 6. Another shot for the Demon Deacons to get a win over a top 10 team and snap the 72-year streak going back to 1946. Notre Dame strolls into next week’s matchup with No. 7 Stanford carrying their best start since 2015. With Stanford’s come from behind 38-31 win in overtime over No. 20 on Saturday, Notre Dame will face a top 10 opponent for the first time since the No. 5 Fighting Irish lost 31-27 to the No. 2 Florida State on Oct. 19, 2014.